We study sequence-specific transcription factors, their regulated gene networks and the mechanisms linking transcriptional activation at promoter level, mRNA translation efficiency and cell outcome. Our main focus is the tumor suppressor protein p53 and, to some extent, its family members p63 and p73. In the recent past, we have also studied transcriptional cooperation between p53 and Estrogen Receptors or NF-kB. We use model systems, including different established cancer cell line and also specialize in exploiting the yeast S. cerevisiae as it provides a highly defined, genetically tractable, and tunable assay system, a.k.a. an in vivo test tube. We are focusing on mechanisms that coordinate transcriptional selection and mRNA translation efficiency resulting in p53-dependent apoptosis of cancer cells treated with small molecules targeting MDM2. Functional classify SNVs in 5’UTR of CDKN2A p16/INK4a gene associated with melanomas. Soares J, Raimundo L, Pereira NA, Monteiro Â, Gomes S, Bessa C, Pereira C, Queiroz G, Bisio A, Fernandes J, Gomes C, Reis F, Gonçalves J, Inga A, Santos MM, Saraiva L. Reactivation of wild-type and mutant p53 by tryptophanolderived oxazoloisoindolinone SLMP53-1, a novel anticancer small-molecule. Oncotarget. 2016 Jan 26;7(4):4326-43. Andreotti V, Bisio A, Bressac-de Paillerets B, Harland M, Cabaret O, Newton-Bishop J, Pastorino L, Bruno W, Bertorelli R, De Sanctis V, Provenzani A, Menin C, Fronza G, Queirolo P, Spitale RC, Bianchi-Scarrà G, Inga A, Ghiorzo P. The CDKN2A/p16(INK) (4a) 5'UTR sequence and translational regulation: impact of novel variants predisposing to melanoma. Pigment Cell Melanoma Res. 2016 Mar;29(2):210-21. Bisio A, Latorre E, Andreotti V, Bressac-de Paillerets B, Harland M, Scarra GB, Ghiorzo P, Spitale RC, Provenzani A, Inga A. The 5'-untranslated region of p16INK4a melanoma tumor suppressor acts as a cellular IRES, controlling mRNA translation under hypoxia through YBX1 binding. Oncotarget. 2015 Nov 24;6(37):39980-94. Ozretić P, Bisio A, Musani V, Trnski D, Sabol M, Levanat S, Inga A. Regulation of human PTCH1b expression by different 5' untranslated region cis-regulatory elements. RNA Biol. 2015;12(3):290-304. Garritano S, Romanel A, Ciribilli Y, Bisio A, Gavoci A, Inga A, Demichelis F. In-silico identification and functional validation of allele-dependent AR enhancers. Oncotarget. 2015 Mar 10;6(7):4816-28. Lion M, Raimondi I, Donati S, Jousson O, Ciribilli Y, Inga A. Evolution of p53 transactivation specificity through the lens of a yeast-based functional assay. PLoS One. 2015 Feb 10;10(2):e0116177. Bisio A, Zámborszky J, Zaccara S, Lion M, Tebaldi T, Sharma V, Raimondi I, Alessandrini F, Ciribilli Y, Inga A. Cooperative interactions between p53 and NFκB enhance cell plasticity. Oncotarget. 2014 Dec 15;5(23):12111-25. 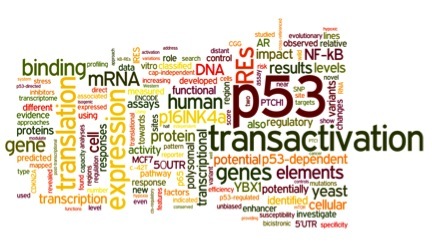 Zaccara S, Tebaldi T, Pederiva C, Ciribilli Y, Bisio A, Inga A. p53-directed translational control can shape and expand the universe of p53 target genes. Cell Death Differ. 2014 Oct;21(10):1522-34.